This Recruiter interview profile brings together a snapshot of what to look for in candidates with a balanced sample of suitable interview questions. Please modify and customize these questions for the position for which you’re hiring. Similar job titles include Corporate Recruiter, Executive Recruiter, Recruitment Manager, Recruitment Director and Technical Recruiter. Make sure that you are interviewing the best Recruiter candidates. Sign up for Workable’s 15-day free trial to hire better, faster. Consider these HR interview questions a starting point for hiring both agency and in-house recruiters. We’ve written them for the sole purpose of helping you find the best person for the job. You know as well as we do that your top candidates should not just be good on paper. You need a candidate who can provide thoughtful responses informed by actual experience. These interview questions for recruiters will highlight more than just work experience and technical skills. These can be modified to IT Recruiter interview questions. You want someone who is doing far more than just putting in the hours and who can ask relevant, intelligent questions on the fly. In addition, you’re screening for specific traits ingrained into the DNA of successful recruiters, such as tenacity and curiosity. Solid organization and communication skills are also important in this line of work. Highlight these must-haves in your recruiter job description. 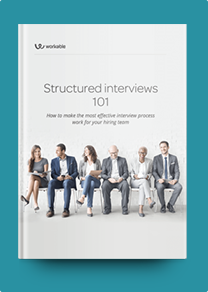 For the best possible outcome, add your own recruiter interview questions tailored to your specific environment. If you are primarily recruiting for roles in finance or technology, your candidate will need to demonstrate knowledge of these fields. If your company does high-volume hiring (e.g. roles in retail, restaurants, and call centers) you’ll want to ask behavioral interview questions get a sense of how well they function in a fast-paced work environment, and how they stay organized while managing large pools of applicants. Describe your preferred mix of candidate sourcing methods. What has worked well for you? What do you no longer do? What was difficult about sourcing in companies you’ve previously worked for? List and describe your favorite tools for tracking and following up with candidates. How do you approach interviews? What is your game plan? What are you trying to find out? Talk about a hiring process from a previous company. What worked well? What didn’t work well? What would you change? Describe your experience with referral programs. How did rewards, technology, and engagement contribute to the overall performance of the program? Is there anything that you would change? Here’s our current time to hire, cost per hire, and success rate. What could we do to improve these? Where would you start? Describe the common challenges of working with hiring managers. What if you were asked to double the volume of your hires next year? What would you change about your process? How would you maintain the quality of your hiring?